Hello, welcome to episode five of the Healthy Diet News and Reviews podcast. 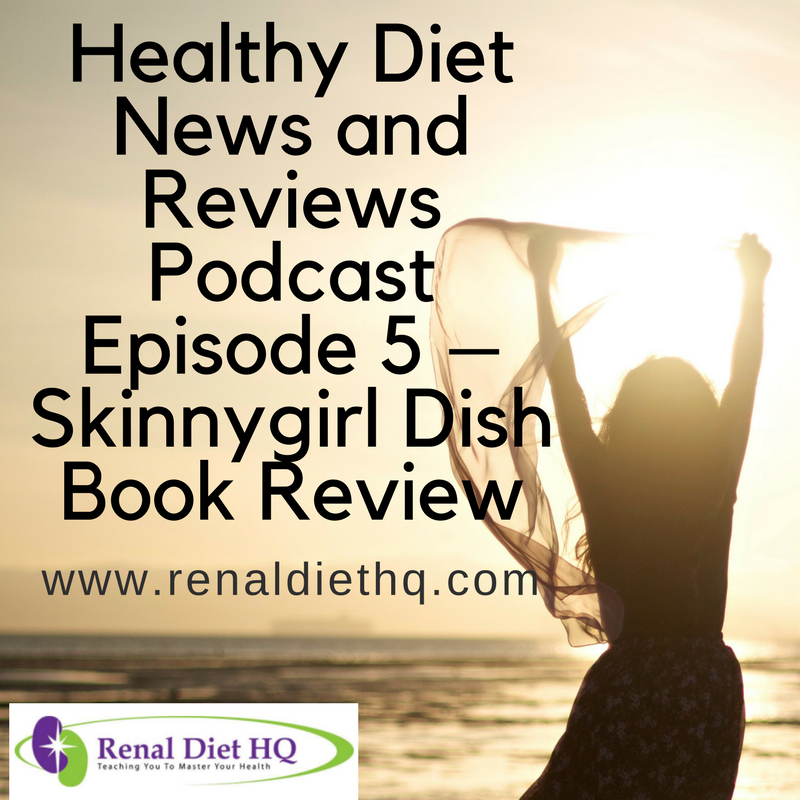 I am going to talk today about “The Skinnygirl Dish: Easy Recipes for Your Naturally Thin Life” The Skinnygirl Dish: Easy recipes for your naturally thin life” by Bethenny Frankel. It was copyrighted in 2010, and it’s under healthy cooking and nutrition. She’s done a book on how to cook using the skinnygirl plan. So I’ll be the first to admit that I have not read the “Skinnygirl” book about how to live the skinnygirl way. She does refer to it a lot in her book. And that made it a little bit more difficult to utilize the book, I guess, if it hadn’t been for having read that prior to this. But she does highlight what the skinnygirl concepts are. And as a general overview of the book, I would say that her plan is that you can adjust recipes to be better for you using some simple substitutions and guidelines. She basically says eat a little bit of everything that you want. Don’t overdo it. Think about it ahead of time. But she talks about different ways, some common substitutions that maybe you don’t know, just as an average everyday person, as far as spices, ways to enhance flavors, things you can do to improve your cooking. And she talks about what items to use in cooking. She actually kind of gives you a little grocery list to always have in your pantry, which I liked quite a bit. She talks about what to make, a variety of recipes from breakfast to dinner. She had breakfast times in there, steel cut oats and dinner items, chickens and different items made with soy milk. Drinks and parties included what to make for your parties, what to drink, a skinnygirl margarita, how to incorporate that into your skinnygirl life. And the only research in the book is really her previous experience or her personal experience. Her experience as a New York Times bestselling author and as a Real Housewife of New York City is her experience that she uses. Plus, she says she’s a chef and that she’s been to chef school, so she knows some of this. And if I used my three words to describe the book, I would describe it as a cooking book. Her favorite words to use in there are “use what you have…” And it does have variety. So those would be the three words, “cooking”, “use what you have”, which I’m using as one word even though it’s a phrase, and “variety”. Responding to the author’s opinion, I’m not sure that she really explains her thinking process on items when she adjusts recipes or goes through explaining. She kind of just tells a story and talks about herself quite a bit. If you try to replicate what she’s doing or you try to adjust your own recipes, I think you’re going to have a harder time and not be as successful. I did like her recipes. Just a little bit too much about Bethenny in the book, too much, “This is how I met my boyfriend, this is what my personal assistants do.” That was a little bit… Just not, for an Oklahoma girl, really what I care about. But it’s written very conversationally and it’s easy to read. So she’s really talking to you just like she’s talking to somebody in a blog or as a regular person. So it’s written conversationally, and she’s getting across her message in that way. To talk about issues that she brought up in the book, I would say that I’m not sure I see her as an expert. Apparently, she does, like I said, have a column where she adjusts celebrity recipes in Health Magazine, and she’s on TV. But I didn’t read “Skinnygirl”, so I don’t know. I just don’t see her as an expert. She didn’t do enough to make me feel like she’s the best there is at this. She says she’s a chef, but there are times when it seems a little inconsistent. Like, “Oh, I just used what I had. I just had soy milk this day and regular milk this day.” To me, I would think that, in the purpose of trying to make it so that I can replicate it, you would try to use the things you expected me to have in the house. I understand, she was making them at home and trying to test the recipes. I can understand that a little bit. But I think, for consistency, she should have probably used some similar ingredients in all of her recipes. Overall, I would say, she kind of paints a picture of a New York society gal who is playing around with cooking and is telling you how to do what she does. I kind of envisioned, in the book, her walking around high heels and an apron. I wouldn’t do that in my own kitchen because I’d break my ankle. I don’t know if that’s the impression she meant to give you or not. But that’s the impression she gave me. So that would be my thoughts on what’s brought up by the book. I think she has good recipes in there and I think her intention is good, as far as adjusting recipes to lower the fat and calories. It’s just that I don’t understand her thought process behind them, always, what she’s doing. That would be helpful, to have a little better understanding behind that. To relate to other concerns or topics, I would say that I feel like eating normal food is an important part of staying on a diet. And she definitely advocates using normal food, not trying sweeteners, not trying all these different specialty, low fat, low cal cheeses. She just really says eating normal food, important to staying on a diet. You’re going to go out to eat sometimes, every now and then you’re going to have a drink. But staying on a diet, or staying on a skinnygirl plan is important. It’s important to eat a balanced amount of nutrients, including fats, proteins and carbohydrates. She really doesn’t advocate that you should be out of balance in any of those. But I think, for a regular young lady, she probably needs to do a better job of explaining why you should have a better balanced diet and get rid of what she refers to as the food noise. She teaches through her mistakes and talks to you about how it’s OK to mess up when you’re trying something new. But I really feel like, if she is a chef, that her mistakes are going to be a little easier to overcome and a little harder to not… I am, as an amateur, going to make some of those same mistakes, but I’m also probably going to make a lot more. Her process of being a chef and knowing what to do, maybe, edits out some of those things that I’m just going to naturally do, like maybe remove a little too much salt or put a little too much of this or that in there that is not as forgiving as what a chef might be able to do. But she does teach that you can make mistakes. And at the end of the day, if you make mistakes, you need to always have a plan B. For her, that’s knowing the number to the bakery, knowing how to recover, knowing what to buy. If you’re making dinner, give yourself enough time to adjust and pull out that frozen item, or get the bakery number. So I liked the book, it was OK. It has some good recipes in it. It talks about some good tenets of eating. I just wasn’t as impressed with how well it was described or how easy it would be to replicate her recipes. But I liked it. It was a good book. I did feel a little bit like a pauper reading a book written by a society queen, though. That’s my only feedback on it. I would recommend it to someone who’s trying to eat normal food, eat more normal food, not necessarily somebody who needs a special diet, or a diabetic or cardiac diet. But somebody who needs to stop hearing all the low carb and all these fad diets, maybe they could follow this and eat more normal foods with adjustments. That concludes this podcast today. I thank you for listening and being a subscriber. If you want to give me feedback, send an email to podcast@healthydietmenusforyou.com. If you have any questions for me that you’d like me to answer in a future podcast, please feel free, also, to send those to podcast@healthydietnewsforyou.com. That comes to me and I will check them over, and in the future, I’m going to do a podcast about questions. So thank you very much. Remember, healthy eating is only a bite away. Thanks.